Insul-CoreTM 0409 Solutions: This is a proprietary formulated aqueous solution of acid, weaker than other acidic materials but stronger than acetic acid. It should be handled with the precautions due an acid, always wear protective clothing and equipment as suggested while being exposed, processing and handling the solution. 9.) A non alcohol filled thermometer is recommended for temperature accuracy for measuring temperature of Insul-CoreTM 0409 Solutions. To Immerse or Spray the core with Insul-CoreTM 0409 Solution and insure contact for the 15 minute process time follow these processing steps: A.) After core preparation as previously described, ensure that laminations are of bare steel-no oxidation should be present or the process will be compromised and not effective. B.) Set up the stator in a well-ventilated area (paint booth or steam booth.) equipment to be worked on requires placement in a well ventilated area. Suggest air exchange: 6 room exchanges per hour or 3500 cfm or greater air draw. C.) Place the stator with the worst damaged part of the bore down (at 6 on a clock face). Use a stainless steel pan of suitable size to catch the draining solution under the core; it needs to be captured as it is a hazardous material. D.) Preheat the core to 180 ° F for large core, 210°f for a small core. E.) Preheat the Insul-CoreTM 0409 Solution in a stainless tank vessel to 180 F. (ensure it DOES NOT boil); provide a large enough vessel for liquid expansion, a vessel about 25% larger than the amount of Insul-Corer 409 Solution to be mixed. (gentle stirring is required during heating and you will need a stainless steel long shafted spoon, ladle or polypropylene stirrer). F.) For Large Cores: Once Insul-CoreTM 0409 Solution has reached 180°F, fill the acid resistant sprayer using the stainless steel ladle and a stainless steel funnel. 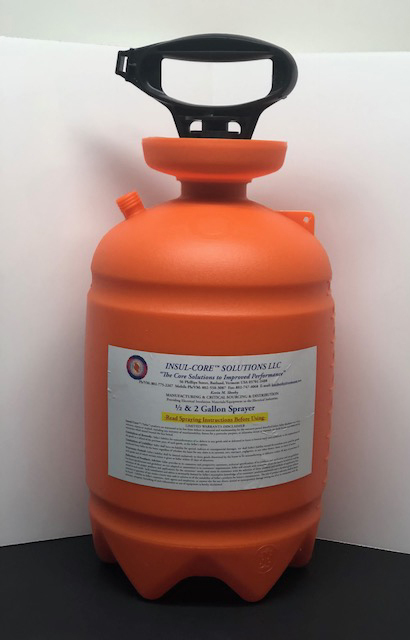 Cover the stainless steel heated vessel containing Insul-CoreTMSolution so as to contain the heated Insul-CoreTM 0409 Solution for further refilling the acid resistant sprayer. Maintain the 180°F Insul-CoreTM 0409 Solution adding more as you require it. Use the acid resistant sprayer to keep the core continuously wetted. Once sprayer is filled you must continuously spray until sprayer is emptied to relieve pressure in sprayer. The core or laminations must be continuously wetted for 15 minutes. G.) For Small Cores: Immerse the core completely in the Insul-CoreTM 0409 Solutions, taking precautions to SLOWLY lower the core into the Solution; the processing reaction will start to take place once the core meets the Solution and will create some bubbling. Use a stainless steel vessel allowing the solution to be about 25% below the top of the vessel. Than pull the core from the stainless steel treatment tank after 15 minutes of complete immersion in the tank. H.) Wait for 10 minutes after finishing the process, than rinse the treated stator with clean water to flush off the white residue left from the processing solution. L.) Dry stator out thoroughly in oven above 212°F and repeat the core test at room temperature to confirm results. The following suggestions for handling have been prepared in accordance with a pattern established by the American National Standards Institute, Publication ANSI Z 129.1 (1994). First Aid: In case of contact, immediately flush eyes with plenty of water for at least fifteen minutes; ensure water flushing of entire surface of eye and lid-Obtain medical attention immediately. Flush skin with plenty of water for fifteen minutes, and then wash with soap and water. Remove contaminated clothing and shoes promptly; launder before re-use. Waste Disposal: When it becomes necessary to discard the processing solution, neutralization of the acidity, precipitation of the dissolved metals and phosphates, and further treatment may be required in order to meet local, state, and federal waste control regulations. 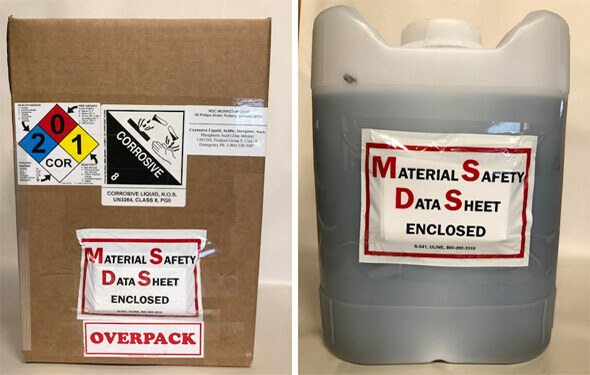 Storage: To meet pollution control regulations now being enforced by several states, Insul-CoreTMSolutions LLC recommends that all chemical products be stored and used in locationswhich will not permit direct access to surface and sanitary drains. These areas should beconstructed in such a manner that any chemicals lost can be either salvaged or suitablytreated to prevent pollution of natural waters. Skin: Immediately flush skin with plenty of water for at least 15 minutes. Wash with soap and water. Eyes: Immediately flush with plenty of water for at least 15 minutes; ensure water flushing of entire surface of eye and lid. Obtain medical attention at once, including ophthalmologic consultation. Inhalation: Remove to fresh air. If breathing is difficult or discomfort persists, obtain medical attention. Ingestion: Rinse mouth with water. Give large amounts of water, milk or demulcents to cause dilution in stomach. Do NOT induce vomiting. Attempts to neutralize with a base should be avoided because of excessive gas and heat formation, which may increase threat of exophagastric perforation. Vomiting and diarrhea (laxative effect of phosphates) are expected with large doses. Parenteral fluid administration may be needed if fluid loss is severe or shock ensues. Supportive care may be needed for other complications such as glottal edema, hematemesis, and perforation (unlikely). Induced vomiting should be avoided because local tissue injury may be aggravated, but patient should be watched for hyperphospatemia and hypocalcemia. Milk or other demulcents may be worthwhile for gastric irritation. External Contamination: Remove contaminated clothing promptly. Launder clothing before re-use; discard shoes. Phosphoric acid is completely and readily soluble in water. If exposed areas are flushed promptly and thoroughly with water, there should be little or no harm. Long-term exposure may lead to rash or burn.